After saving three cryogenically frozen people from the early 21st Century, the Enterprise is sent to the neutral zone to investigate a possible incursion by Romulans. There is no mention at the start of this episode of the ramifications of the previous one. The Federation was almost the victim of a massive invasion, with several admirals and key personnel having been subject to extreme mind control that came to a sudden end when Remmick was killed. Ships like the Horatio were lost, whole stations were left unmanned, ships were shuffled around, defenses were weakened, and much more, and yet, at the start of this episode, it's business as usual. Such was the nature of episodic prime time television in the old days. Space debris is not something you often think about in Star Trek. It's interesting that the Enterprise just happens to be hanging out in empty space when the derelict spacecraft just happens to float by. Granted, the odds of that ever happening, given the extreme size of space, are infinitessimal, but it's still a nifty idea. Ah, disk drives. How quaint. The door doesn't automatically open, so Worf pulls out his phaser. Typical Klingon. What's the deal with the empty cryotube? Did somebody wake up? 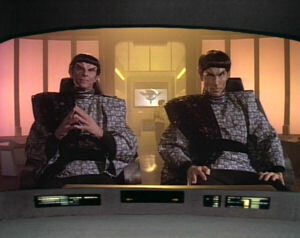 They talk about the Romulans as though nobody knows anything about them anymore after a 50 year silence. However, just a few episodes ago ("Angel One"), the Enterprise was supposed to go to the Neutral Zone because Romulan battle cruisers had been detected near a border post. Usually, when people talk about being cryogenically frozen to cheat death, they talk about doing it before a person dies. However, Crusher makes it absolutely clear that these people were frozen after dying. I can understand how 24th Century medicine can cure just about anything, but how does Crusher so nonchalantly bring them back to life after they've been dead for about four hundred years? The one woman died of a sudden embolism while alone in her home, which means that she had to have been dead for quite a while before she was discovered. She had no standing plan for being frozen when she died and is convinced that somebody must have talked her husband, Donald, into having her body frozen. This means she was probably dead for days before they froze her. Why did the writers make this decision when they didn't need to? These people could have been frozen before they died, and it would (a) be more in line with the theory of cryogenics and (b) make a hell of a lot more sense. Also, Crusher says that people were terrified of dying back in the late 20th Century, implying that, in the 24th Century, nobody worries about dying anymore. Um, what? If death is no big deal in the 24th Century, why was Crusher so upset about her son being sentenced to death? Seriously, Crusher, people aren't scared of death anymore? I don't care if you can prevent all headaches and bring back frozen corpses; you still haven't cured people of their mortality. I know it's a plot device, but why does Riker use the comm panel on the wall when Picard calls him? Why doesn't he just use the communicator, like everybody else always does? We have never seen anybody use a comm panel on a wall until this episode, and it is thrown in for completely arbitrary reasons. Heck, when people on the ship are called, they usually just respond out loud without even tapping their communicator. The 24th Century Romulan vessel is one of Star Trek's coolest spaceships. If nobody's heard from the Romulans in 50 years, does that mean Worf is over 50 years old? When he was an infant, his parents were killed by Romulans at Khitomer. Worf even says that the Romulans were "supposed to be our allies" when the attack took place, so people clearly had knowledge of Romulans at that point. If Worf is saying the Romulans and Klingons were allies (which is really hard to believe, but that's another story), then maybe you could argue that the Klingons have had contact with the Romulans more recently than the Federation. Still, the Klingons and the Federation are allies, so they would certainly have shared some information about the Romulans when this whole situation came about. The dialogue between the Romulans and Picard is incredibly well-written. Every sentence uttered by the Romulans is dripping with innuendo, veiled insult, and subtle prodding, but none of it is lost on Picard, who is careful to follow Troi's advice from earlier in the episode. This episode annoys me. You have this cool story about Romulans and the mysterious disappearance of several Federation outposts, but it gets sidelined for almost the entire episode by a secondary plotline involving incredibly irritating stereotypes that have no relationship whatsoever to the regular characters. This is the second appearance of Marc Alaimo. Best episodes: "Where No One Has Gone Before," "11001001," and "Coming of Age." Worst episode: "Code of Honor"
The first season of Star Trek: The Next Generation is a transitional stage in the development of Star Trek. The show at times tries too hard to mimic the original series, and that is usually when it is at its weakest. From the standpoint of somebody familiar with what TNG eventually becomes, it's easy to point out where the writers get it right and where they get it wrong, because I know the elements of TOS that stick around and the ones that are ultimately discarded to make room for TNG's unique storytelling opportunities. However, when I try to forget what I know about the future of the Star Trek franchise, I am able to get a lot of enjoyment out of this tentative run of episodes that fall somewhere between TOS and TNG. It's goofy, to be sure, with embarrassing special and visual effects, music that is dialed up way too high, writing that is wooden, and characters that haven't found their place yet, but it's still fun, with occasional flashes of brilliance that hint at what's to come for the show. Copyright ©2011 e. magill. All rights reserved.